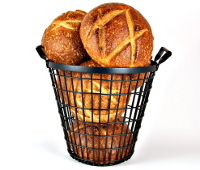 One of the most enjoyable places to visit in San Francisco is our Boudin Sourdough Bakery and Restaurant at Fisherman’s Wharf. 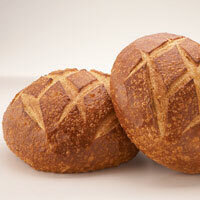 There you can enjoy our classic bread bowls filled with our famous Fisherman’s Wharf Clam Chowder. We hope you will visit soon. Until then, enjoy this “taste of San Francisco clam chowder ” at home.With No MSG and reduced Sodium, Fat and Carbohydrates it is all the better. Just heat and serve for an excellent meal. 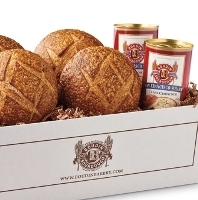 Includes: qty 6 - 19 oz cans of All New Boudin San Francisco Wharf Clam Chowder. From timothy hower of scottsdale, Arizona on 5/1/2018 . From Kathleen Terusa of Sylmar, California on 3/31/2018 . From t culp of memphis, Tennessee on 12/26/2017 . From sratty@suddenlink.net of Hot Springs Vg. , Arkansas on 12/11/2017 . From Ronda Ronda Peterson of Boulder, Colorado on 10/30/2017 . From Jane Owen of PORT NECHES, Texas on 9/22/2017 . From Richard of Millersburg, Pennsylvania on 12/31/2013 . 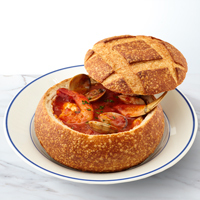 “An authentic taste of San Francisco”, Paladini’s all natural Cioppino Soup is best served with our crusty Bread bowls – ideal for dipping into the delicious broth! This original recipe from the 1890’s, serves as a versatile base for your favorite soup.